Ever wondered why some people seem to have it all made while others simply drift by? What is the difference between successful CEOs, political and religious leaders, and the rest of us who may lead more mundane and ordinary lives? 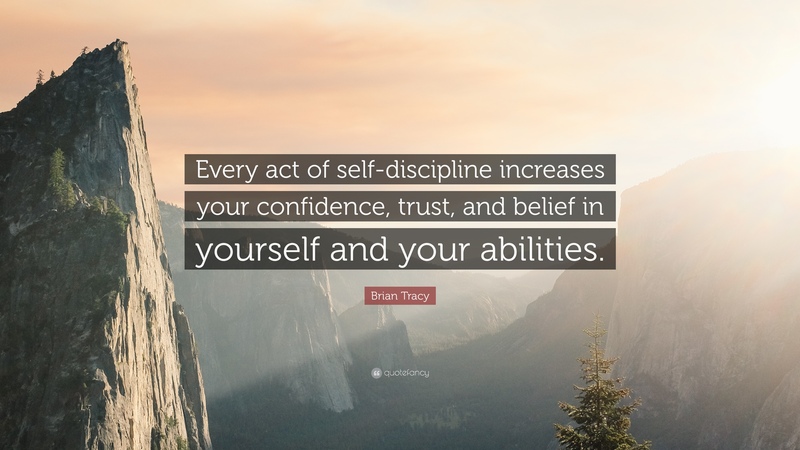 The secret, according to motivational speaker and author Brian Tracy, is that successful people run their lives according to the principles of self-discipline. In his audio CD The Miracle of Self Discipline, Brian shared that successful people often do the things which unsuccessful people do not like to do. They learn to overcome their human weaknesses, adopt positive behaviours and habits that help them become more productive, are promoted more quickly in any job, and invest themselves so that they can gain greater self-esteem, self respect and personal power. With self-discipline, one could achieve greater personal mastery and have the strength to overcome all obstacles until one succeeds. It is the key to stronger self-confidence and to achieving personal greatness. The quality of one’s thinking affects the quality of one’s decisions which in turn affects the quality of one’s results and finally, the quality of one’s life. To embrace this discipline, make time for quiet and unadulterated chunks of time to think. Sit in solitude for 30 to 60 minutes a time to think through issues. The answer will come as you activate your superconscious mind. You can also go for a walk without an iPod or anything just to think better. Also, be open to doing something completely different. Do it every single day. Make it a habit for 21 days and it will transform your life. Focus on your A tasks first and foremost. Concentrate on those and stay with them until they are done BEFORE doing any of the others. Overcome the fear of failure and kill all your “I can’ts”. To realize your potential, you need to make courage a habit by practicing whenever it’s needed. Do the thing you fear and the death of fear is certain. This isn’t easy of course. The natural tendency is for humans to avoid doing the things which we fear. Often the fear is only in your own mind, override the fear by saying to yourself “I can do it! I can do it!” repeatedly and you’ll pick up habit of courage. And then you should “Just Do It” like Nike says! Live to be 95 to 100 years old as your goal! Design your ideal body, make a list of how to make your perfect body. Use a picture of you in beautiful shape and think of yourself as superb health. Eat less and exercise more. Many successful people like CEOs get up at 5 am and work out for an hour before starting the day. This helps to get their energy levels up while releasing endorphins that help them feel happier and be more productive. Eliminate the 3 white poisons of flour, sugar and salt (and maybe rice), and focus on eating fruits, vegetables and proteins. Drink lots of water, eat light and leave your last meal to three hours before you go to bed. Set yourself a goal to achieve financial independence, and cultivate an aversion to debt. Buying things on credit may set you up for a life where you are always in debt. If you associate buying things with being happy, you may end up being broke your whole life! To change this, rewire your brain to say “I like saving money”. Develop the habit of saving money, of delayed gratification (ie delay the purchases of big ticket items), and to shift your funds to investments. Save up to 10%, 15%, 20% of your income throughout your life. Put your money in various investment vehicles, spreading your risks, and capitalising on the value of compound interest. Strive to achieve financial independence and financial freedom. Most self-made millionaires work 16 to 17 hours a day until they make their break. The average person waste up to 50% of their time at work, surfing the Internet, chit chatting with coworkers, reading the newspapers etc. By eliminating these bad habits, one would be able to work all the time when one works and to focus on getting the things done first before engaging in social activities. To increase your productivity, start one hour earlier at work! When other people comes in, you are already running. If necessary, work through lunch rather than wasting time. The other is to work one hour later. In fact, most business owners do this. To earn more, you need to learn more. Work at least as hard on yourself as you do on your work. A tip is to read daily, at up to 60 minutes a day if you can. Reading 50 books a year gives you an equivalent of a PhD in a year. Listen to CDs or Podcasts in a car, bus, MRT also helps you keep abreast of the latest knowledge. You should also attend seminars and workshops to learn and increase your knowledge and skills constantly. The greatest test of self discipline is when you persist in the face of adversity and drive yourself to complete your task 100%. Courage has two parts. The first part is the courage to begin and to launch in the face of failure with no guarantee of success. The second part of courage is to endure and keep on going even when there is no guarantee of success and a likelihood of failure. If you truly believe in what you’re doing, the more you will persist. The more you persist, the more you believe in yourself and the value of your work. In fact, persistence in self-discipline in action. Self discipline leads to self-esteem which leads to greater self discipline and greater self esteem. This article was written by Walter Lim, leading marketer, social media advocate, and founder of content marketing agency Cooler Insights.